A Shepherds Tale: When dogs go bad. Days such as the 8th December leave you feeling completely drained and wondering why you spend so much effort looking after the flock only to have it ravaged in that appalling way. When the OH returned we went to all the local farms again and further afield in an effort to trace the dog[s] responsible. We couldn't rest easy knowing that at any moment there could be another attack. We didn't want to leave the farm for any length of time and spent a lot of time checking the ewes. I was still treating Autumn and the other ewe but they would survive which was in itself a small miracle. On the 20th December we were treating one group of ewes in our Bergerie when suddenly the other group of ewes came charging down the field and trying to leap over the fence, two dogs were behind them. And behind the two dogs a man and a boy were trying to catch them!!! It looked very much like we had found the culprits. The man was someone we had already spoken to and he lived across from our top fields were the previous attacks had taken place. Apparently one of the dogs was his and the other belonged to a neighbouring farmer. The problems occurred when the two dogs got together. And to answer JJ these were ordinary domestic dogs, a family pet and a farm dog that went wild when they got together. We went to see both owners and left them in no doubt that if were any further attacks we would go to the Gendarmes to get the dogs destroyed. They assured us that the dogs would be kept under controll, in the meantime their insurance would cover our losses to date. We also pointed out that our ewes were all in lamb and we could well experience further losses before or at lambing time. They agreed that we would also be compensated for unusual losses of lambs. The compensation did not of course make up for the ordeal we and the ewes had been through but we felt that with the dogs identified we would have no further trouble!!!!! 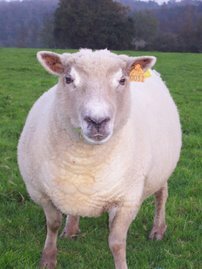 Lambing in 2000 started in January and our worst fears were realised, all the trauma the ewes had suffered had a pretty devestating effect. Ewes were lambing up to a week prematurely, this may not sound much but a lot of the lambs growth occurs in the last few weeks, so we had lots of small weak lambs and many didn't survive. We had quite a lot of lambs born dead, and it was obvious they had been dead in the womb for some time, there were also more breech births which meant we had to be even more vigilant than normal. We had several cases of mastitis and one ewe died. There were also a number of ewes that should have lambed but must have aborted after the first attacks. If I say that our mortality rate is usually about 3or 4% then 16% that year was APPALLING and that didn't included the losses from the aborted lambs. We found it quite devestating to be continually burying dead lambs. We were compensated for the losses but not for the heartache, all that effort and the sleepless nights only to deliver another dead and sometimes rotting lamb. By the time we were nearing the end of lambing we felt completely exhausted, physically and emotionally. We had just a few of the agnelles left to lamb, it was April and the days were getting longer and warmer, the ewes and lambs were enjoying the Spring sunshine. We hoped that that was the end of our troubles, we needed a rest. Oh my god, I can't believe that normal domestic dogs could do that. Horrible. How could you go on??? i think I would have had to stop.